Earlier this week, a talented team from Rubbermaid, along with professional organizer Jill Annis, descended on Watertown, Wisconsin to do something wonderful and impressive: give back. Thanks to winning Rubbermaid's Give the Gift of Organization contest, a small non-profit named Mary's Room was given a $5,000 makeover to make their space more easily usable. 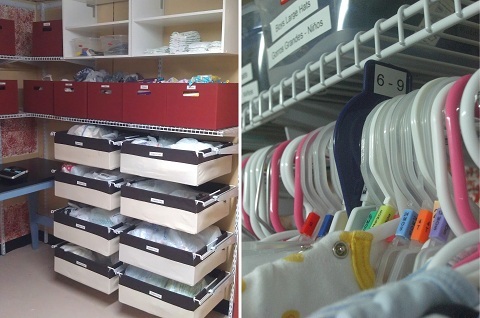 After all, providing diapers, wipes, bottles, baby furniture, clothing and more to families in need would be made immensely easier by having designated spots for each one. I have to admit, my jaw dropped open a little bit when I saw the Before photos and just how much this room needed to be organized. 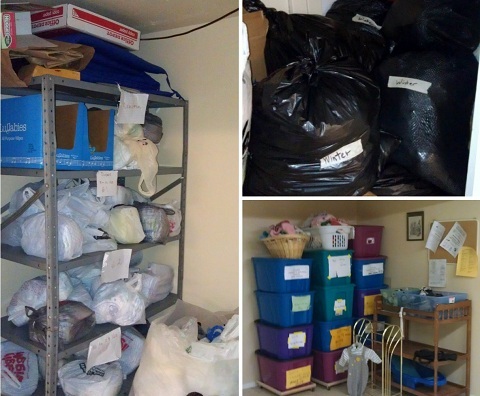 With generous donations arriving all the time and women and children who need to receive them, it seems like it would be a constant struggle to find everything necessary when they're stored in plastic bags, stuffed on shelves or hidden in bins, right? So, while it's great to hear about any company that takes the time to do something gracious and kindhearted, I was especially touched thinking about how this makeover would help so many families receive the supplies that would make such an impact in bettering their lives and situations. As the After photographs started to come in, I was already excited seeing the transformation start to take place and the thought behind the choices Rubbermaid had made and the products they had used. Bilingual labels on bins so that more people could find what they need, strong hooks to hold gear up off the floor, plenty of space to hang clothing, everything perfectly labeled... what an organizational dream come true! It brings tears to my eyes to see such a contrast to the way that items had previously been stored in bins or laid out in piles! I love the way that the Rubbermaid products used are all going to be plenty sturdy and durable to hold up to many more years of good deeds by Mary's Room. Just look at the strength of those hooks, shelves and baskets! 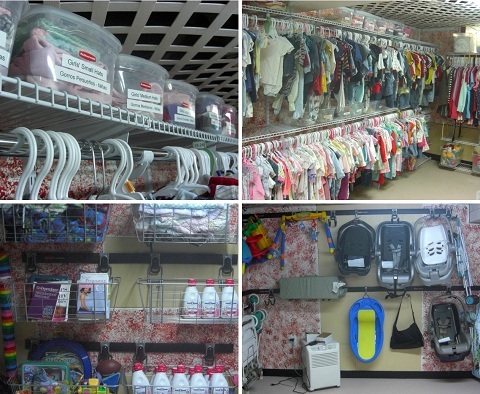 From big changes to small, Rubbermaid and Jill Annis didn't leave out the details that will make it quick and easy for everyone in Mary's Room to find exactly what they need for each person that enters their doors. Congratulations to Mary's Room on having a wonderful new space to further your commitment to helping your community! A big kudos as well to Rubbermaid and Jill for demonstrating the meaning of generosity, kindness and altruism and for doing an amazing job on this makeover and changing so many lives for the better. That turned out great! I'm sure those people will really appreciated it.